Devon Aoki and Lily Cole at the Roland Mouret's Rainbow Collection launch for NET-A-PORTER. Lily Cole and Terry Gilliam at the after party of the premiere of "The Imaginarium of Doctor Parnassus." Lily Cole at the Roland Mouret's Rainbow Collection launch for NET-A-PORTER. Lily Cole at the premiere of "The Imaginarium of Doctor Parnassus." Lily Cole and Enrique Murciano at the after party of the premiere of "The Imaginarium of Doctor Parnassus." Lily Cole at the after party of the premiere of "The Imaginarium of Doctor Parnassus." Lily Cole and Terry Gilliam at the Japan premiere of "The Imaginarium of Doctor Parnassus." Lily Cole at the UK premiere of "A Single Man." Livia Giuggioli and Lily Cole at the UK premiere of "A Single Man." Lily Cole at the Japan premiere of "The Imaginarium of Doctor Parnassus." Lily Cole and Enrique Murciano at the premiere of "Exit Through The Gift Shop." Lily Cole at the Royal world premiere of "Alice in Wonderland." Lily Cole at the premiere of "The Imaginarium of Doctor Parnassus" during the 4th Rome International Film Festival. 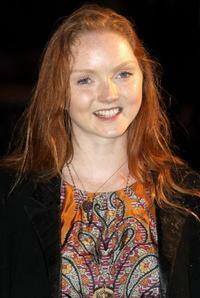 Lily Cole at the screening of "The Imaginarium of Doctor Parnassus." Terry Gilliam and Lily Cole at the premiere of "The Imaginarium of Doctor Parnassus." Lily Cole at the photocall of "The Imaginarium of Doctor Parnassus" during the 4th Rome International Film Festival. Lily Cole as Valentina in "The Imaginarium of Doctor Parnassus." Heath Ledger as Tony and Lily Cole as Valentina in "The Imaginarium of Doctor Parnassus." Lily Cole as Valentina and Andrew Garfield as Anton in "The Imaginarium of Doctor Parnassus." Lily Cole as Valentina and Colin Farrell as Imaginarium Tony 3 in "The Imaginarium of Doctor Parnassus." Christopher Plummer as Doctor Parnassus and Lily Cole as Valentina in "The Imaginarium of Doctor Parnassus." Christopher Plummer as Dr. Parnassus and Lily Cole as Valentina in "The Imaginarium of Doctor Parnassus."